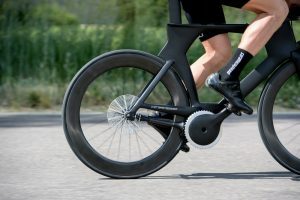 Bike parts manufacturer CeramicSpeed partnered with the University of Colorado’s department of mechanical engineering to introduce a chainless bicycle drivetrain concept. The revolutionary drivetrain, known as DrivEn, won the 2018 Eurobike Innovation Award at the Eurobike show, a major tradeshow in Germany. Derailleurs and chains are replaced with a pinion-style driveshaft system. 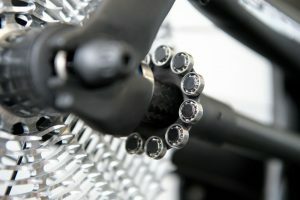 The system utilizes low-friction 21 CeramicSpeed bearings that transfer torque effortlessly from the front ring through the drivetrain and onto the 13-speed rear cog. The bike creates 49 percent less friction than the high-end Shimano Dura-Ace chain-and-derailleur setup. The bike has less drag, less weight, and takes up less space than traditional bicycles.